The Peshastin-Dryden Striders — and their superheroes — are off! 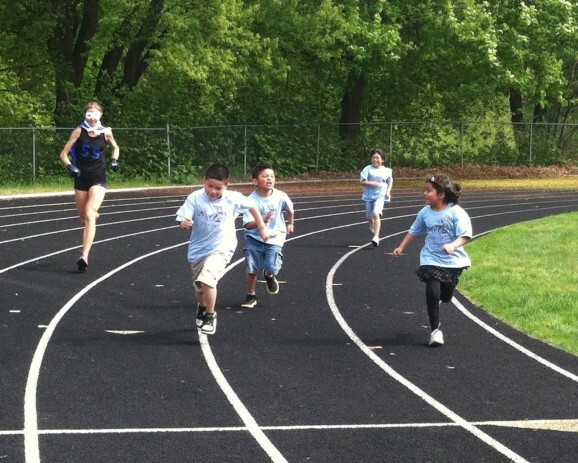 What am I willing to do to get kids to run? What outlandish act isn’t too embarrassing to attempt for the sake of getting kids to move and sweat and smile all at once? I’ll tell you. For 15 minutes of “glory,” I became Super Strider, the superhero of running! It was one of those ideas that you can envision in great detail. 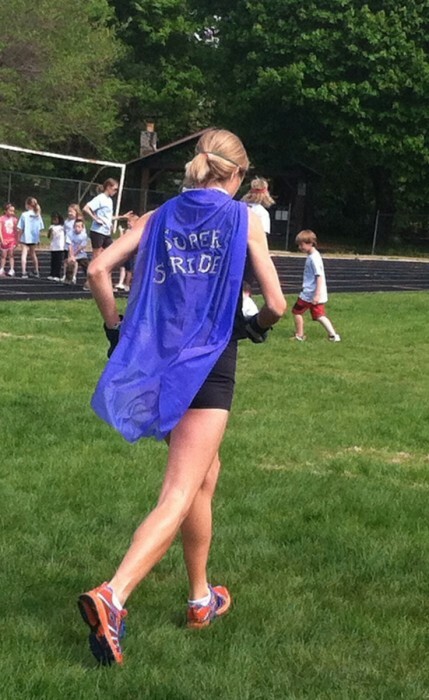 And it’s amusing, even thrilling, to wear a shiny blue cape and white mask, letting that unstoppable feeling surge through me, propelling my legs and arms in quick rotations, running through and with a crowd of Peshastin-Dryden kids and we’re all cheering for each other’s effort around the track. Marlene Farrell, as Super Strider, rounds the corner with members of the Peshastin-Dryden Striders running club. Somehow the idea escaped my head, leaked out of my mouth, found some co-conspirators (a cape maker, a Superman theme song player, a fellow Super Strider) and became reality. I find myself in the sound system box of the Peshastin-Dryden stadium, the cape is on, the fast flashy shoes have my feet dancing and I am looking down at the kids, 80 Striders, doing skips and grapevines with the other volunteers on the football field. For a split second I am someone else, not the coach of this energetic gang, but an observer on the sideline. But that second is gone and it’s time to get this show started. We leap out of the stadium box while the principal announces us. I charge, in slow motion, an exaggerated tiptoeing down the bleachers with my vision reduced to thin slits through the mask. Once on solid ground my legs flow like water, rushing, and then we’re bouncing and waving and standing tall and proud like all superheroes do. After the initial gawking and giggling subside, the Striders split up into three and head to their starting spots on the track. 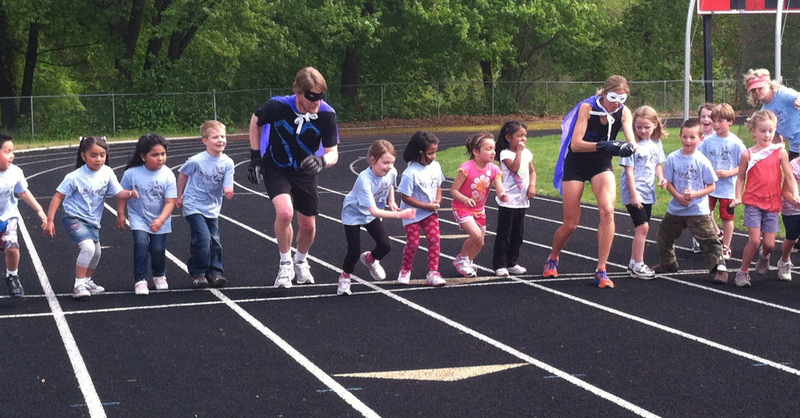 The Super Striders are at the start line with clustered kindergartners. There’s a false start, some pausing, shuffling, turning back, but then we’re off, messily, at least all heading in the same direction. Oops, the first graders are taking off, too, rather than waiting for the passing of the Super Striders. We reel them in anyway and volunteers are starting to catch on, making the kids stop and wait for the Super Striders to come round again. On the second lap, a kid is down, my counterpart picks her up and brushes her off, her face on the verge of crying but she shakes it off and keeps going. I’m caught in the moving mass of kids, so I keep on and have to step carefully because one child darts in front of me where the mask makes a blind spot. I barely miss plowing through him. The laps blur. Sometimes I’m alone but then there is another group, poised to sprint, looking back, waiting for me. Kids shout back, “I’m beating you, Super Strider!” I tell them they’re making me tired, though despite the heat and my dry throat I feel like I could run, lap after lap, until everyone’s cheeks are lit up and we collapse in the grass, gasping. I discover my unintended, unexpected sacrifice when I glance over and see my son’s tear-streaked face. He’s not running. He hasn’t fallen down. He’s huddled behind one of the cheerleader platforms. I’m doing this, being this ridiculous, for him and he is miserable! The reasons that unfold later are complex, but right now my superhero abilities are powerless to solve this problem. Another mom has her arm around him. A later lap shows me the principal is checking on him. And yet I have to keep moving. This is my show so I can’t resign, not even for the heartache of my own son. Then it’s over and the track is crowded now with middle schoolers and high schoolers starting their practices. I feel their eyes on me, some of these teenagers that I’ve coached before, and their emotions, whether ridicule or bemusement, slip into the backdrop of the 6- to 8-year-olds, front and center, striping me of my mask, revealing my identity. We walk together, a brief cool down and I’m left wondering, “Did it work? 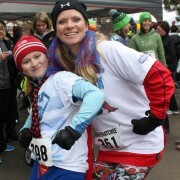 Was there a bit of magic, inspiration, fun?” Some Striders ran their hearts out. 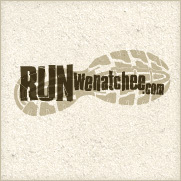 Some ran less, perhaps walking after the novelty of the first couple laps wore off. And then, there’s my son. A reporter hovers. I invited him but now I kind of regret it. Before I can face him and his questions, I need to find my son. Off come the gloves and the cape and I hold his hand in my own, seeking forgiveness from his fingertips. We walk up to the school for snacks and to jot down mileage in the logbooks. In this moment I need to be more than coach or superhero. I need to be Mom. Sometimes the situation requires me to wear all the hats at once. It’s not pretty and perhaps a bit foolish. However, my intentions are good and I hope, in the long run, that is what matters. 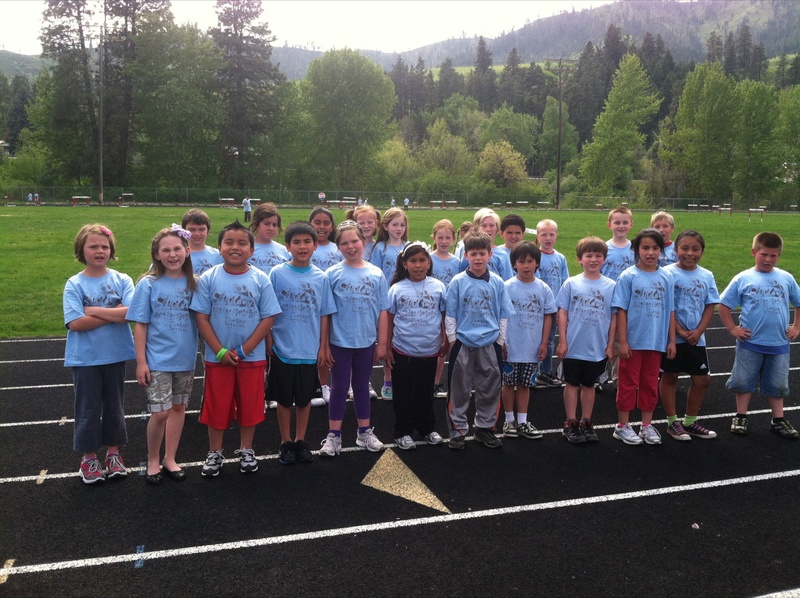 The Peshastin-Dryden Striders pose for a photo.